A simply gorgeous day creating a really personal and very wearable garment with its own story to tell embellished with fragments of old fabric and snatches of stories. 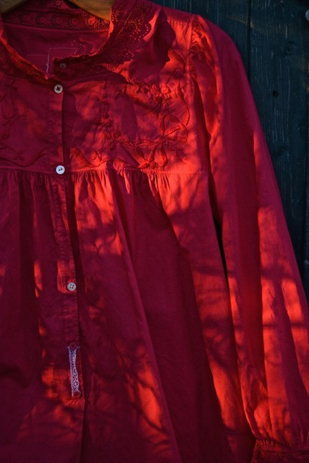 I love to use old and worn garments – vintage French shirts, Victorian (shortened) nightdresses and even my husband’s old and worn striped shirts. You’ll need to bring along a garment to work on – a good quality & weight of cotton is recommended. Throughout the day we will machine stitch patches of vintage fabrics onto your shirt and then further embellish with hand stitching. I have always loved the shape of garment pieces, seam lines, collars and button bands. I’ll inspire you to find some of these beautiful lines and shapes in your own garment and to highlight them with stitching. You’ll be working with a fabulous selection of vintage and used materials from my studio such as – old handkerchiefs, vintage table linens, 1940’s floral fabrics, old pieces of lace and whatever else comes to hand. By using old and used materials we are bringing their stories to the piece too! 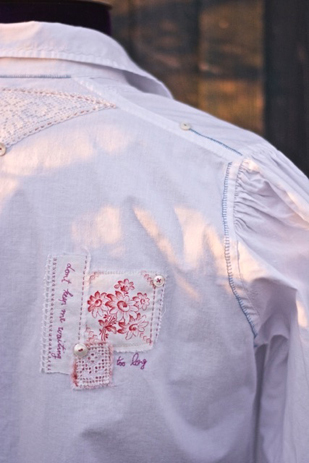 We’ll be introducing little glimpses of stories by stitching text onto our shirts. 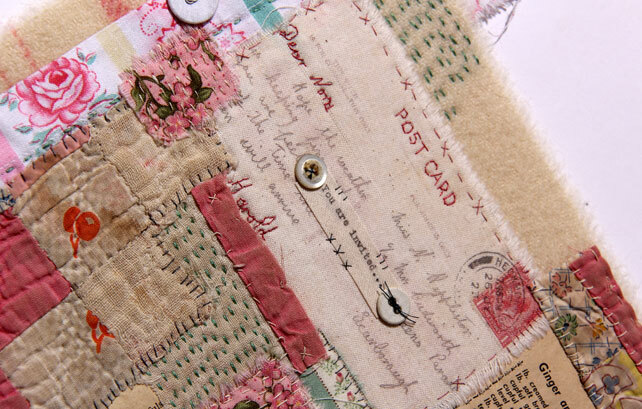 Either bring along a favourite piece of old handwriting in the form of an old letter, postcard or even a handwritten recipe – make sure the writing isn’t too tiny. I will also introduce you to the story of Ada and words from Ada’s letters written to her sweetheart Mackie during WWII. You won’t finish your shirt on the day – hand stitching is really slow – but you’ll be given all the guidance you need to finish at home. You’ll leave with a gorgoeus project to work on and enjoy in your own time. In my experience you may never finish your garment because you’ll keep wishing to add more – the beauty is that you can wear & enjoy your work in progress! While a great selection of old & used materials will be provided you may wish to bring along some bits & pieces from your own stash. 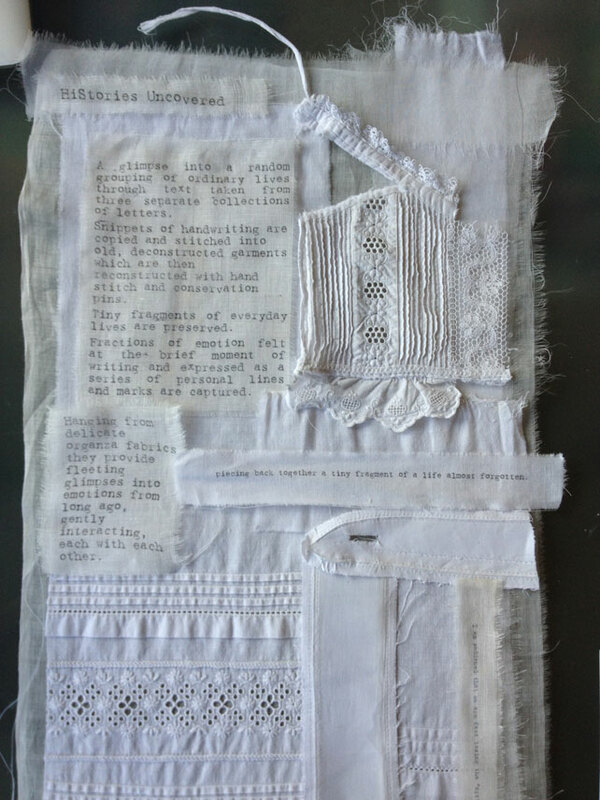 Think about fragments of lace, old fabric scraps, stitched table linens and any other old bits and pieces that delight you. Do remember that these will have to withstand wear and washing. 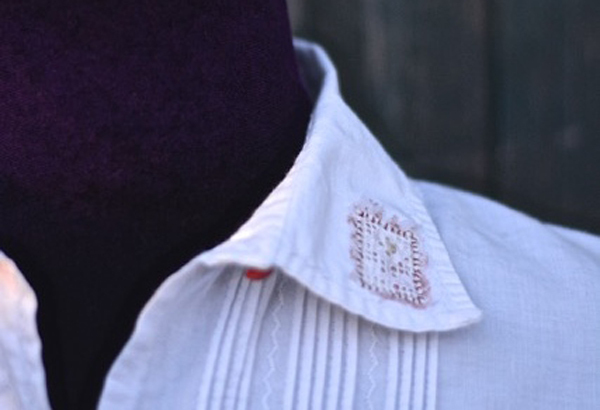 A pre washed shirt to embellish – cotton preferred, please don’t bring anything stretchy, shiny or flimsy. 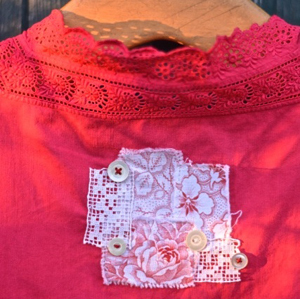 Machine sewing thread in a neutral colour that will work with your shirt. 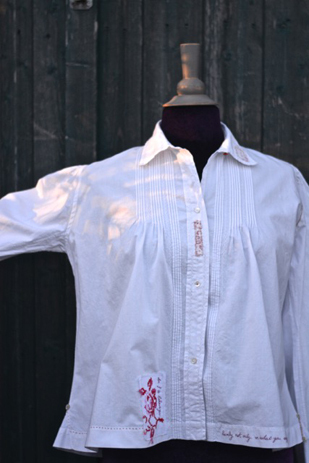 It is possible to arrange your own intimate Story Shirt workshop at my studio, The Purple Thread Shed. All you need is four people who can bring along their own sewing machines.